YANGON—Calls are mounting for an investigation into Myanmar’s Union Civil Service Board (UCSB) in the wake of disclosures that it provided training and a master’s degree program for high-ranking government officials via two unaccredited foreign universities. The scandal broke last month after a Myanmar scholar doing a degree at Oxford University in England revealed on Facebook that Hawaii-based Akamai University and an affiliated institution, Malaysia’s EDS Business School, were working with the UCSB, a government agency responsible for recruiting and training civil servants. Neither university is recognized by the government of its home country. The scholar, Ko Nay Yan Oo, posted videos of Akamai University showing two small rooms in a two-story building he described as being no bigger than “a grocery store”. On a door of one of the rooms, a sheet of A4-sized paper could be seen bearing the name of the purported university. The posts were widely shared and many netizens questioned the motivation for the UCSB’s decision to partner with the institutions. Initially, the UCSB defended its relationships with the “universities”. It posted on its website on Dec. 30 that both were accredited by the U.K.-based Accreditation Service for International Colleges (ASIC)—an organization that has faced allegations of accrediting “degree mills”. Following heavy criticism from the public on social media, the UCSB said on Jan. 9 that after a review, it had ended its partnerships with the two institutions on Jan. 4, and vowed to collaborate with worthier universities in the future. But no further details, nor any explanation of how the relationships were formed, have yet emerged. Ko Nay Yan Oo told The Irrawaddy that simply ending the cooperation was not enough. “They must explain to people why they worked with those institutions. How much [public] money has been spent on those two universities? Public funds spent on those two universities have been wasted,” he said. Under their partnerships with the board, Akamai University and EDS Business School conducted several courses starting in 2017, according to data from UCSB. They offered courses like “Strategic and Corporate Planning for a Public Sector Organization”, “Competencies for Transformational Leadership for Civil Service”, “Developing a Good to Great Culture for Civil Service” and “Effective Supervision and Team Leadership Methods for Civil Service” to directors of government departments, lecturers from the county’s central institutes of civil service, and officials from the Civil Service Affairs Department and the Civil Service Selection and Training Department. From May 8-13, 2017, leadership training was also given to officials from Union-level institutions and permanent secretaries from Union ministries. In 2018, a “Master of Leadership in Civil Service” program was launched. Daw Cho Mar Myint, UCSB spokesperson and assistant secretary, told The Irrawaddy on Jan. 10: “The decision to stop collaborating with them was made by the chairman,” referring to Dr. Win Thein—who himself received an honorary doctorate from Akamai University in 2014. She added that the two-year master’s program, which was attended by around two dozen directors and deputy director-generals, would also be scrapped. Asked if the decision to end the collaboration was prompted by the ongoing public criticism of the bogus university, the UCSB spokeswoman declined to comment. Who is Dr Win Thein? Before assuming the leadership of the UCSB, ex-military man Dr. Win Thein served as the principal of the Myanmar Mercantile Marine College. His Army background began with the Defense Services Academy (DSA)’s Intake 11, the same class as ex-general U Shwe Mann, considered the third most powerful man in Myanmar’s former military regime. U Win Thein also served as a member of the Union Parliament’s Legal Affairs and Special Cases Assessment Commission in 2012. The UCSB has requested several budget increases in recent years. Under the 2017 Budget Law (for April 1, 2017 to March 30, 2018), it sought 9.3 billion kyats. For the six-month interim budget from April 1 to Sept. 30, 2018, it asked for 4.6 billion kyats. In the latest budget law for fiscal 2018-19, it asked for 39 billion kyats—an amount larger than the requests from some ministries, including those of the State Counselor’s Office, Hotels and Tourism, Religious Affairs and Culture, Commerce, Industry and Ethnic Affairs. Ko Myo Min, founder of PS Business School, said it was shocking that a government agency would work with unaccredited foreign universities to offer training to government officials. “The problem of fake degrees and degree mills happens all over the world… But here, [the government] has neglected to address it. If they are at fault, they need to admit and provide an explanation to the public. Just saying ‘We have cut ties’ is so reckless,” he said. Accreditation aside, Ko Nay Yan Oo saw a possible conflict of interest in UCSB’s partnerships with the two bogus universities. UCSB chairman Dr. Win Thein and his nephew Dr. Win Min Thein have longstanding ties with Akamai University and EDS Business School. Dr. 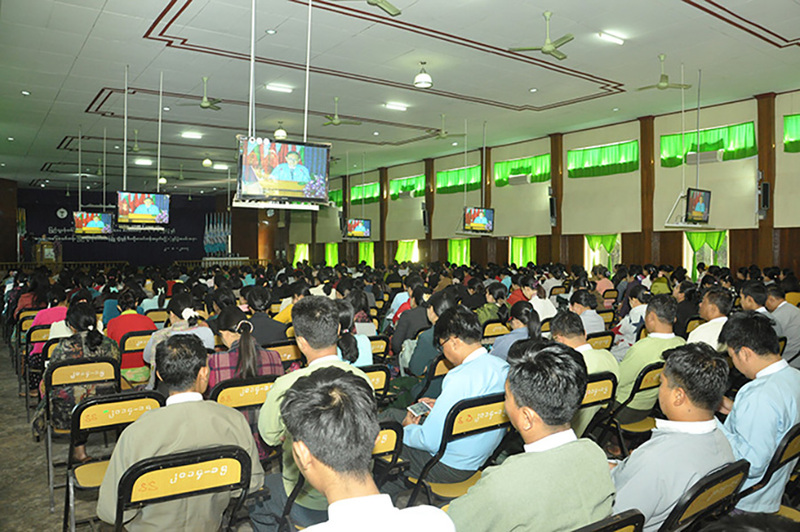 Win Min Thein founded a business institute, Yangon City Training Center, in 2012. In 2017 it was renamed Nanyeng International College. He also works as a visiting professor at the UCSB’s central institutes of civil service. His father, U Min Thein, is a member of the Naypyitaw Development Committee. Ko Nay Yan Oo said he had discovered that Dr. Win Min Thein first held discussions with Akamai University and EDS Business School about offering business management training in Myanmar in late 2013. Akamai University appointed Dr. Win Min Thein an assistant professor in its Asia Program. 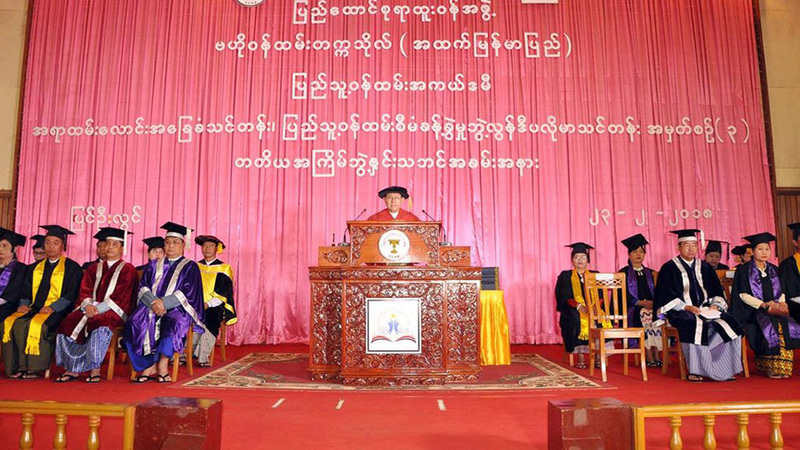 In October 2014, Akamai University bestowed U Win Thein, who was then a member of the Legal Affairs and Special Cases Assessment Commission, with a Doctor of Philosophy Honoris Causa in Educational Leadership in Yangon. According to Ko Nay Yan Oo, Dr. Win Min Thein and EDS Business School held discussions on the training programs in late 2016 in Yangon. U Win Thein was appointed as UCSB chair in April 2016. He later approved the two universities to offer training with the UCSB. In 2017, EDS Business School awarded Dr. Win Min Thein the Presidential Award for Distinguished Achievement. He said he would submit complaints to the President’s Office, State Counselor’s Office and Anti-Corruption Commission calling for an investigation of the UCSB. Upper House Lawmaker U Myo Win, a National League for Democracy member from Mon State who has a record of calling for civil service reform in Parliament, agreed with Ko Nay Yan Oo. “Personally, I believe there must be responsibility and accountability for the [UCSB’s] cooperation with unaccredited universities,” he said. The President’s Office and Anti-Corruption Commission (ACC) are aware of the case. Responding to a reporter’s question on the scandal at a press briefing in Naypyitaw last week, President’s Office Spokesperson Zaw Htay said the UCSB had ended its partnerships with Akamai University and EDS Business School. Contacted by The Irrawaddy last Friday, an ACC member said there was no immediate plan to launch an investigation into the case for the time being. “If there is a complaint over the case, we will have to review it first,” commission spokesperson U Kyaw Soe told The Irrawaddy.